Many tasks that are very simple for most humans to do are extremely difficult to solve for a computer. Conversely, quite a few that appear intractable for most of us happen to be very easy for machines – a paradox known as Moravec’s paradox. For instance, computers are able to integrate, differentiate, solve differential equations, memorize large amounts of data, all in a fraction of the time that any human genius would need just to get started on any of these tasks. On the other hand, despite decades of concerted efforts by computer scientists, machines are still unable to, for instance, speak and/or understand human communication. The machine understanding of a natural language has long been the holy grail of research into Artificial Intelligence. All the way back in the 1950s, Alan Turing proposed the now famous ‘Turing test’ to determine whether a computer is as intelligent as a human. The test proceeds by having the computer communicate with a number of human ‘judges’. These judges are not told whether they are ‘talking’ (essentially via text-based exchanges) to a computer or to a fellow human. If, at the end of the test, the judges are unable to reliably determine whether they had been talking to a machine or a human, then the machine is deemed to be as “intelligent” as a human. Solving the problem of “understanding” human/natural language would enable machines to undertake most of the tasks that are performed with relative ease by humans, from translation and writing, to summarising texts and conducting interviews. They could combine their natural strengths (memorisation and complex problem solving) with the understanding of language to create a virtual genius. It would enable us to build a computer not unlike the one in Star Trek, where Captain Picard asks the computer questions as if to a human, which the machine duly, and swiftly, answers. 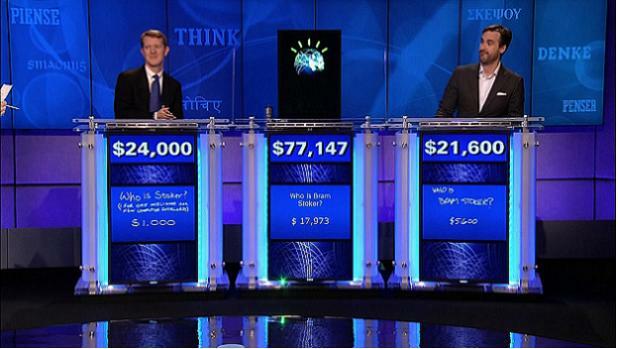 It is in an effort to produce computer systems like this that IBM has ventured to create a machine that could compete at Jeopardy, the popular TV game. Jeopardy, a long-standing staple of American TV quiz shows, involves questions touching on various topics ranging from pop culture and sport to history, literature and science. Its unique feature, however, is that contestants are presented with an ‘answer’ to which they must find a corresponding question, in other words, the answers are questions. For instance, the presenter might say “He is the 44th President of the United States”, to which a contestant should answer “Who is Barack Obama?”. Over a course of several years, IBM built a computer consisting of 2880 Power7 processors. They named it ‘Watson’, after the founder and first president of the company. Having made the machine read the human equivalent of 200 million pages of text, they decided to pit it against former human champions. One of them was Brad Rutter, Jeopardy’s biggest ever money winner. The other contestant was Ken Jennings, who had previously won 75 consecutive matches and $2.5 million. At the end of the tournament, Watson came ahead with about double the score of his two rivals. So what does this mean for the future of computing? And for our notions of human intelligence? IBM have said that, for their part, they hope to create marketable spin-off systems that will do anything, from analysing financial data and helping the government, to answering simple trivia questions. The home PCs of today are nowhere near computationally powerful enough to perform anything close to what IBM’s Watson can do, but with computing power doubling every 1.5 years (an observation known as ‘Moore’s Law’), this is bound to change within the next 10-15 years. Looking further ahead, we can expect to see computers that can perform virtually every task that humans can perform to the equal or better standard. What we decide to do with this kind of power is going to shape the future of mankind to levels not seen before. Beyond the ethical arguments around Artificial Intelligence, the technological leaps and achievements that have already been notched up, and those predicted, are surely bound to change humanity’s conception of itself forever. Whether this would be for the better or not is, of course, a question nobody can answer, not even Watson.